The Working Girl's Shoe Closet: Welcome! I’m a shoe lover and it started as a child. Despite my private school wardrobe restricting me to a uniform, I still had an impressive shoe collection. My sister would tease me that I should open my own shoe store. In my day job, I’m an urban planner and I’m a big public transit supporter/advocate/user. However, I love all things fashion and think that you don’t have to sacrifice style for being environmentally conscious. I also believe you can marry your desires to be fashion forward with practicality and comfort. So, that’s where I came up with this notion. As a government employee, my shoe funds need to be well allocated for maximum fashion style. And while I have gone slightly into debt on occasion for some of my Manolos and Louboutins, I look for ways to get the same level of style, quality and comfortable high heels in more affordable options that are work appropriate. I’m just your every day working city girl who agrees that “flats are for quitters” but understand that flats are important and necessary – from time to time. ;) Enjoy! The shoe seen above is the 'Jenera' Pump by Linea Paolo. 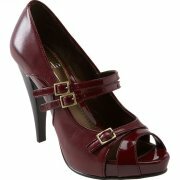 You can find it at www.nordstroms.com for a fantastic deal at $59.90 which is 50% off the regular price of $119.95. I've found that the Linea Paolo line have great squishy insides that make it an extremely comfortable shoe. I've found this squishy factor unique to their shoes. The Jenera's 1940's feel makes it a classic shoe that is a great staple to have in any working girl's shoe closet.